A new research program is using the Hoover Archives to study the original Russian-language records of the Soviet Union’s long involvement in Afghanistan, including the ten years of intense military conflict there. Dubbed Mining Afghan Lessons from Soviet Era (MALSE), the program explores ways in which the United States and coalition forces serving in Afghanistan might benefit from the Soviet experience, as reflected in primary sources. It seeks to draw out lessons for policy and decision makers, relying on not just historical insights but also modern data-analysis technology, and to advance scholarship. Hoover distinguished fellow George P. Shultz, a former secretary of state who guided U.S. foreign policy during most of the era of Soviet Afghan intervention, has called this project a “real-time use of the archives” to facilitate U.S. goals. MALSE finds, retrieves, translates, and analyzes formerly top-secret Soviet documents. Their content ranges from grand strategy decisions to on-the-ground assessments by the Politburo and other officials of the Soviet Communist Party, state, and military, as well as by Afghanistan’s contemporary leaders. The results should prove useful to scholars, policy makers, and military leaders alike. 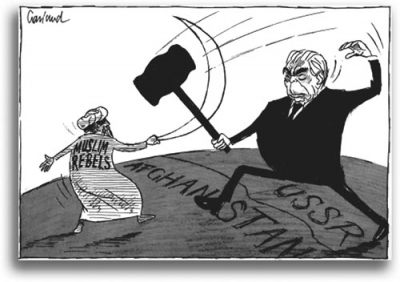 Foreshadowing a clash still raging 30 years later, “Muslim Rebels” duel with Soviet leader Leonid Brezhnev in this 1980 cartoon from the Telegraph (U.K.). Soviet forces had invaded Afghanistan the previous year to support a client leader and his Communist state, but were soon entangled in a conflict with irregular forces, at the time backed by the United States. The study is part of the Empirical Studies of Conflict (ESOC) project, which identifies, compiles, and analyzes records on insurgency, civil war, and other forms of politically motivated violence worldwide. The MALSE program enhances its research methods with innovative uses of modern analytical technologies. Along with in-depth qualitative analysis of the documents in their historical and political context, the study explores the use of advanced computer programs to help scholars detect and grasp important patterns that may be difficult to spot by ordinary reading. Among other things, the technology allows rapid screening for linguistic patterns and visualization of connections among people, events, places, and other features of the documents to aid in their understanding. The Soviet period bequeathed Afghanistan large quantities of military hardware—some still functional. The research team includes both military officers and scholars. Hoover research fellow Joseph H. Felter, an Army colonel who co-directs ESOC, commands the International Security Assistance Force’s (ISAF) Counterinsurgency Advisory and Assistance Team in Afghanistan. Jacob Shapiro, assistant professor of politics and international affairs at Princeton University, is also a co-director of ESOC. Other members include Colonel Michael R. Fenzel (U.S. Army), a brigade combat team commander who earlier served as a battalion task force commander in Afghanistan and a director for transnational threats at the National Security Council; Lieutenant Colonel Stanton S. Coerr (USMCR), the commanding officer of the 4th Air/Naval Gunfire Liaison Company; Professor Nancy Roberts of the Naval Postgraduate School Common Operational Research Environment lab, where many advanced analytic computational systems used for the study are deployed; Michael Samoilov, a researcher at the California Institute for Quantitative Biosciences at UC-Berkeley; Reed Davis, a political-science professor at Seattle Pacific University; and students at SPU. The study is supported by the Office of Naval Research’s Expeditionary Maneuver Warfare & Combating Terrorism Department. Many of the challenges that the United States and its coalition allies face in Afghanistan mirror those that confronted the USSR during its military intervention of 1979–89, but there are differences as well. The Soviet Union eventually gave up its front-line efforts to sustain a Soviet-friendly but highly unpopular Afghan government and left after a decade of military conflict, massive aid spending, shifting alliances, and stalemate on and off the battlefield. Before the Soviet army left, the Kremlin’s extensive planning and preparation for withdrawal had allowed the last Afghan Communist government to survive for a time. It fell in 1992, not long after the USSR broke apart. 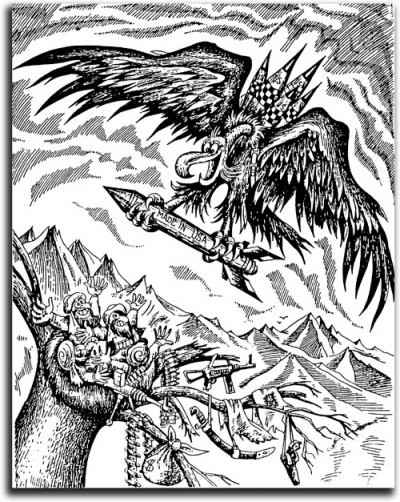 An August 1986 cartoon from Krokodil, a Soviet satirical magazine, shows an American eagle bearing gifts of Stinger missiles to Afghan mujahideen. “Catch!” cries the eagle. “And I must also hurry to Angola!” The Red Army was then approaching the end of a decade of inconclusive combat in Afghanistan. The mujahideen used U.S.-made Stingers to great effect against Soviet aircraft. A bloody power struggle ensued among Afghanistan’s many social, ethnic, and religious groupings. This, as we know, paved the way for the Taliban takeover, Al-Qaeda training camps, and the September 11 attacks on the United States. These attacks prompted a renewed intervention by foreign powers, now led by the United States, into Afghan affairs. The United States and its allies are fighting many of the same insurgents that America supported during the Soviet intervention in Afghanistan. Meanwhile, the coalition is trying to retain the uncertain allegiance of those who remain on the Western side while checking the spread of Islamist terrorism from or within this region. The Soviet legacy still shapes not only Afghanistan’s battlefields but also its daily life. Remnants of that era include mines, unexploded ordnance, and other items useful to insurgents who make homemade bombs, known as improvised explosive devices (IEDs). The Soviet period bequeathed Afghanistan large quantities of military hardware—some still functional—which attests to the Kremlin’s abandoned efforts to strengthen Afghan security forces against insurgents. The United States and its allies now pursue that aim. The MALSE project analyzes Soviet records about Afghanistan in a way that strips away propaganda, reporting biases, historical revisionism, and other misleading or erroneous information. For example, internal Soviet planning discussions can be examined in light of what happened afterward. What remains is a clearer picture of how strategies and tactics were actually developed and then executed, instead of how they were publicly announced or assessed. The resources are formidable. The Hoover Institution has secured nearly 25 million pages of the highest-level official Soviet documents for scholarly use. As noted by Richard Sousa, the library and archives director, Hoover has collections that are now closed even in Russia. What are some of the similarities between the Soviet and the U.S. experiences? Both countries had to take geopolitical trends into account while pursuing their aims in Afghanistan; both had to learn about and work with tribal customs, navigate hostile terrain, promote trade, and conduct asymmetrical combat operations against insurgents who were militarily inferior yet resolute and resourceful. Consistent challenges also included effectively distributing civilian aid and promoting education. The Soviet experience offers both a guide to ongoing threats and a warning of lessons yet unlearned as the coalition role continues to evolve. It also suggests change is possible. This land has for centuries attracted interventions by major world powers and their militaries, only to demonstrate how it can frustrate them—and yet Afghanistan also was a showcase of peace and economic development for more than forty years before the Communist takeover. Notable among the records is the long shadow Josef Stalin cast on both Soviet and Afghan affairs. Even amid the glasnost and perestroika reform movements and more than thirty years after the dictator’s death, Soviet leader Mikhail Gorbachev mused at a Politburo meeting about how he “once received a medal for writing an essay titled ‘Stalin—is our battle glory, Stalin—is the flight of our youth!’ ” At that same March 1986 meeting, the Soviet leaders talked about the failure of Afghan client leader Babrak Karmal, whom they were about to depose, and the behavior of Stalin’s daughter, Svetlana Alliluyeva. The Hoover Institution has secured nearly 25 million pages of the highest level official Soviet documents for scholarly use. Stalin was more than a memory. The methods employed by the Soviet-supported Afghan Communist government to deal with internal strife and persecution of political opponents were heavily indebted to Stalin’s mass purges and his own Afghan policies. Here, again, the vast Hoover Archives allow scholars to go directly to the source. For example, a coded message from 1937 reports to Stalin on a “broadly branched espionage-nationalistic insurgent organization,” centered in Herat (Afghanistan) and “comprising prominent representatives of Western espionage,” which is allegedly involved in “preparation of an armed insurrection” and has a large organizational role “played by the Afghan consulate” in Soviet Turkmenistan. Agents and insurgents are said to include former basmachi (anti-Soviet Muslim rebels whose forces Stalin had already destroyed) in Soviet Central Asia. In response, Stalin simply orders the arrest of all Afghan citizens who might fall under suspicion. Stalin was more than a memory. The methods used by the Sovietsupported Afghan Communist government against political opponents were heavily indebted to Stalin. Both of these predictions came to pass. Yet until now, the former Politburo members were the only ones to have heard them. The goal of the MALSE project is to uncover more such information and make it useful in a timely manner to support U.S. national security goals.